Instant downloads of all 945 LitChart PDFs (including The Brothers Karamazov). 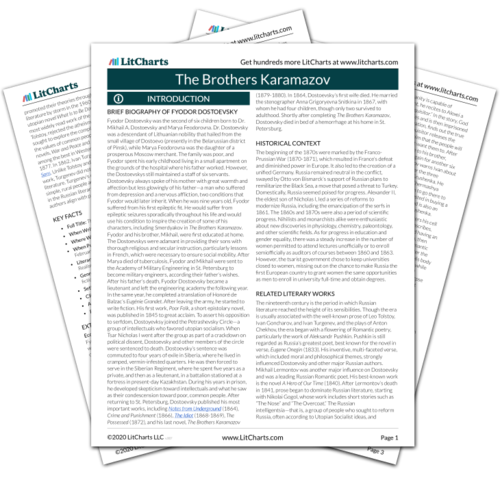 Welcome to the LitCharts study guide on Fyodor Dostoevsky's The Brothers Karamazov. Created by the original team behind SparkNotes, LitCharts are the world's best literature guides. A concise biography of Fyodor Dostoevsky plus historical and literary context for The Brothers Karamazov. A quick-reference summary: The Brothers Karamazov on a single page. In-depth summary and analysis of every chapter of The Brothers Karamazov. Visual theme-tracking, too. Explanations, analysis, and visualizations of The Brothers Karamazov's themes. The Brothers Karamazov's important quotes, sortable by theme, character, or chapter. Description, analysis, and timelines for The Brothers Karamazov's characters. Explanations of The Brothers Karamazov's symbols, and tracking of where they appear. An interactive data visualization of The Brothers Karamazov's plot and themes. Fyodor Dostoevsky was the second of six children born to Dr. Mikhail A. Dostoevsky and Marya Feodorovna. Dr. Dostoevsky was a descendant of Lithuanian nobility that hailed from the small village of Dostoevo (presently in the Belarussian district of Pinsk), while Marya Feodorovna was the daughter of a prosperous Moscow merchant. The family was poor, and Fyodor spent his early childhood living in a small apartment on the grounds of the hospital where his father worked. However, the Dostoevskys still maintained a staff of six servants. Dostoevsky always spoke of his mother with great warmth and affection but less glowingly of his father—a man who suffered from depression and a nervous affliction, two conditions that Fyodor would later inherit. When he was nine years old, Fyodor suffered from his first epileptic fit. He would suffer from epileptic seizures sporadically throughout his life and would use his condition to inspire the creation of some of his characters, including Smerdyakov in The Brothers Karamazov. Fyodor and his brother, Mikhail, were first educated at home. The Dostoevskys were adamant in providing their sons with thorough religious and secular instruction, particularly lessons in French, which were necessary to ensure social mobility. After Marya died of tuberculosis, Fyodor and Mikhail were sent to the Academy of Military Engineering in St. Petersburg to become military engineers, according their father’s wishes. After his father’s death, Fyodor Dostoevsky became a lieutenant and left the engineering academy the following year. In the same year, he completed a translation of Honoré de Balzac’s Eugénie Grandet. After leaving the army, he started to write fiction. His first work, Poor Folk, a short epistolary novel, was published in 1845 to great acclaim. To assert his opposition to serfdom, Dostoyevksy joined the Petrashevsky Circle—a group of intellectuals who favored utopian socialism. When Tsar Nicholas I went after the group as part of a crackdown on political dissent, Dostoevsky and other members of the circle were sentenced to death. Dostoevsky’s sentence was commuted to four years of exile in Siberia, where he lived in cramped, vermin-infested quarters. He was then forced to serve in the Siberian Regiment, where he spent five years as a private, and then as a lieutenant, in a battalion stationed at a fortress in present-day Kazakhstan. During his years in prison, he developed skepticism toward intellectuals and what he saw as their condescension toward poor, common people. After returning to St. Petersburg, Dostoevsky published his most important works, including Notes from Underground (1864), Crime and Punishment (1866), The Idiot (1868-1869), The Possessed (1872), and his last novel, The Brothers Karamazov (1879-1880). In 1864, Dostoevsky’s first wife died. He married the stenographer Anna Grigoryevna Snitkina in 1867, with whom he had four children, though only two survived to adulthood. Shortly after completing The Brothers Karamazov, Dostoevsky died in bed of a hemorrhage at his home in St. Petersburg. Get the entire The Brothers Karamazov LitChart as a printable PDF. The beginning of the 1870s were marked by the Franco-Prussian War (1870-1871), which resulted in France’s defeat and diminished power in Europe. It also led to the creation of a unified Germany. Russia remained neutral in the conflict, swayed by Otto von Bismarck’s support of Russian plans to remilitarize the Black Sea, a move that posed a threat to Turkey. Domestically, Russia seemed poised for progress. Alexander II, the eldest son of Nicholas I, led a series of reforms to modernize Russia, including the emancipation of the serfs in 1861. The 1860s and 1870s were also a period of scientific progress. Nihilists and monarchists alike were enthusiastic about new discoveries in physiology, chemistry, paleontology, and other scientific fields. As for progress in education and gender equality, there was a steady increase in the number of women permitted to attend lectures unofficially or to enroll semiofficially as auditors of courses between 1860 and 1863. However, the tsarist government chose to keep universities closed to women, missing out on the chance to make Russia the first European country to grant women the same opportunities as men to enroll in university full-time and obtain degrees. The nineteenth century is the period in which Russian literature reached the height of its sensibilities. Though the era is usually associated with the well-known prose of Leo Tolstoy, Ivan Goncharov, and Ivan Turgenev, and the plays of Anton Chekhov, the era began with a flowering of Romantic poetry, particularly the work of Aleksandr Pushkin. Pushkin is still regarded as Russia’s greatest poet, best known for the novel in verse, Eugene Onegin (1833). His inventive, multi-faceted verse, which included moral and philosophical themes, strongly influenced Dostoevsky and other major Russian authors. Mikhail Lermontov was another major influence on Dostoevsky and was a leading Russian Romantic poet. His best-known work is the novel A Hero of Our Time (1840). After Lermontov’s death in 1841, prose began to dominate Russian literature, starting with Nikolai Gogol, whose work includes short stories such as “The Nose” and “The Overcoat.” The Russian intelligentsia—that is, a group of people who sought to reform Russia, often according to Utopian Socialist ideas, and promoted their theories through literature—took Russian literature by storm in the 1960s. Nikolay Chernyshevsky’s utopian novel What Is to Be Done? (1863) may have been the most widely read work of the century. Dostoevsky, along with Tolstoy, rejected the atheism of the intelligentsia. Their novels sought to explore the complexities of daily life and championed the values of common people. Tolstoy published his greatest novels, War and Peace and Anna Karenina, which are regarded among the best in Western literature, between 1863 and 1877. In 1862, Ivan Turgenev published the novel Fathers and Sons. Unlike Tolstoy and Dostoevsky, who disliked Turgenev’s work, Turgenev did not seek to answer life’s big questions in literature. Turgenev’s compassionate stance toward both simple, rural people and intellectual nihilists made him an exile in the Russian literary community, which demanded that authors align with particular classes. When Published: The first installment was published on February 1, 1879. Climax: Fyodor Karamazov is found bludgeoned to death. Ecclesiastical Courts. In The Brothers Karamazov, Ivan Fyodorovich writes an article on ecclesiastical courts, which was popular in Russia in the 1870s. The responsibility of the courts, which held jurisdiction among “fallen Christians” in both the clergy and among the laity, was to identify a person’s sins, admonish the sinner, return them to a righteous path, and, if this failed, to excommunicate them. Ecclesiastical courts had only moral authority and could not withdraw political or civil rights. Such courts are found today among those of Jewish, Muslim, and Christian faith but they deal strictly with administrative issues, such as the maintenance of clerical property. Sutton, Mary. "The Brothers Karamazov." LitCharts. LitCharts LLC, 19 Mar 2019. Web. 23 Apr 2019. Sutton, Mary. "The Brothers Karamazov." LitCharts LLC, March 19, 2019. Retrieved April 23, 2019. https://www.litcharts.com/lit/the-brothers-karamazov.